CES 2015: Cambridge Audio reveals six-strong CX series | What Hi-Fi? The new Cambridge Audio CX series includes six components: a network music player, two stereo amplifiers, a CD transport and two AV receivers. The new range promises to "revolutionise entertainment in the digital age" no less, and sports a fresh design style. The hi-fi and home cinema components offer support for high-res streaming, 4K upscaling, aptX Bluetooth, DSD playback and more. Prices range from £300 to £2000 for the Cambridge CX series, which is getting its official launch at CES 2015 in Las Vegas and will go on sale by the end of Q1 in the UK, US and elsewhere. The company has also revealed a new-look logo, which will see the dropping of the 'Audio' part of the name for a simpler 'Cambridge' brand name on some products - including this CX series. New Cambridge Connect streaming apps for Android and Apple iOS devices also appear to use this naming structure. Leading the line is the CXN network music player, which aims to build on the success of the StreamMagic. Connect the CXN music player to your home network, wired or wirelessly, and you'll be able to choose from a host of sources thanks to an impressive selection of inputs. You can stream from connected UPnP devices - such as computers and NAS drives over your network - and there's support for Apple AirPlay out-of-the-box and the option to add the BT100 aptX Bluetooth dongle. USB inputs let you play music from connected HDDs, USB sticks or audio devices, while the CXN also has coaxial and optical digital inputs. There are analogue and digital outputs in the form of RCA, XLR, coaxial and optical connections. High-res 24-bit/192kHz files are supported, whether in AIFF, ALAC, FLAC or WAV formats, while all the standard digital file formats are also on the spec sheet. All inputs are upscaled to 24-bit/384kHz quality, while the Wolfson WM8740 DAC - as used in the DacMagic - takes care of the digital-to-analogue conversion. The CXA80 and CXA60 are the two new stereo integrated amplifiers in the CX series, with the former being the more powerful of the two. Delivering 80 watts in to 4 ohms, the CXA80 uses fully symmetrical dual-mono Class A/B amplification. It features digital coaxial, optical and USB inputs, as well as standard analogue connections. The (presumably cheaper) CXA60 loses the USB and XLR inputs, and offers 60 watts in to 8 ohms. Both amps use the same Wolfson WM8740 DAC. Designed to work with these two stereo amplifiers is the new CXC CD transport, which delivers a pure digital signal to a suitable amp or DAC. The CXC sports Cambridge Audio's S3 servo to ensure the optimum performance of the transport in order to play CDs "more accurately and with better timing". Last in the new Cambridge range is a pair of CXR AV receivers - the CXR200 and CXR120. Both, says Cambridge, aim to deliver the necessary sound quality for "audiophiles seeking a powerful, immersive home cinema experience". The AV amps deliver 200 and 120 watts per channel respectively, with the more powerful CXR200 sporting an extra HDMI input (eight inputs, two outputs compared with seven and two), plus support for a Zone Two. 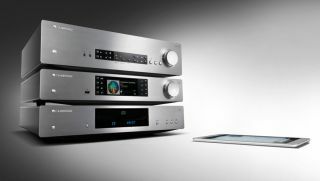 Both amps support 7.2-channel sound, 4K and 3D video, streaming capabilities as found on the dedicated CXN network player, high-res support, DSD and SACD playback, and MHL and USB connectivity. Again, the new Cambridge Connect phone and tablet apps can be used to control the devices.